Home to a diverse, bustling, international economy, Singapore serves as a microcosm of the world in terms of the challenge for workers and employers to find one another. Employers face considering candidates from all over the world, possessing different skills, language abilities, even availability. Prospective employees typically must weather a bombardment of advertisements and spammy listings when looking for a job (unless they’re fortunate enough to have an inside track to a position). The reality is that the perfect person for a job in Singapore may be a world away, completely game for a geographic and career move, but at an utter loss about how to connect with that ideal employer. As its straightforward name suggests, Jobs Singapore was founded with the clear aim of helping job seekers find the right jobs with ease. Job seekers who join the platform gain access to a user friendly and professional job portal where they can browse the latest job listings and search under job categories. What they will thankfully not encounter are spam ads and bogus listings that waste precious time. 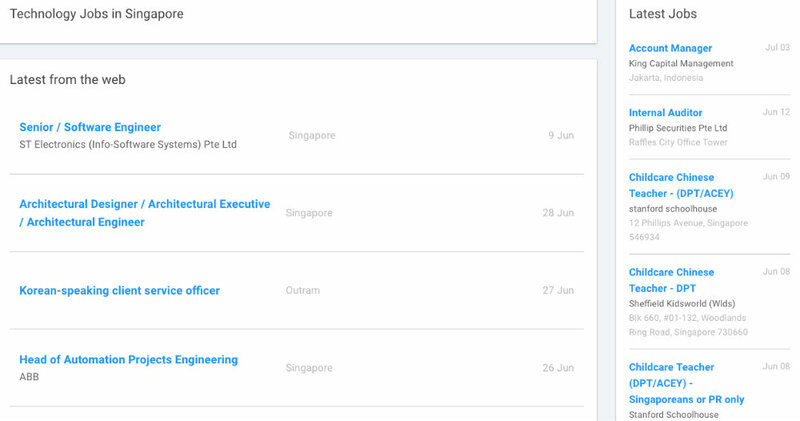 Jobs Singapore screens out the mass listings that choke other platforms with an advanced AI tool. The system as a whole is smart – you can leave information about the type of offers you’re interested in and Jobs Singapore will send you notice when they become available. On the employer side of the equation, employers can post a job listing free for 30 days. This gives them a simple an economical way to advertise a position. At just a dollar a day, $30 for a period of 30 days, employers can increase their visibility on the platform. In other words, they can recruit more aggressively without breaking the bank. Jobs Singapore also affords employers the ability to leave pre-screening questions for each job listing. This simple measure can effectively filter out undesirable candidates, which saves everyone involved time and hastens the hiring process. The website provides additional resources, useful to both parties. Job seekers have links to tools for creating CVs as well as recruiting agencies. Employers have step-by-step guides for creating their job listing to help them post more effective job listing. And the Jobs Blog acts as a useful window into the dynamic economy of Singapore – pointing everyone toward current and future opportunities. Looking to hire an employee in Singapore with maximum ease and speed? Want to find your dream job without falling down a fruitless rabbit hole of listings? Sign up to Jobs Singapore for free at jobssingapore.co.